Ms. Girlee’s regular Carrie Yancy. Photo: Gately Williams. 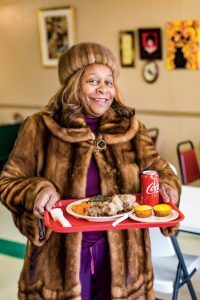 “We’re church people,” Aaron Leach says when I ask how his family came to run a soul café on the edge of the North Memphis neighborhood known as Smokey City, once thick with factories and working-class families. “When I got called to the church, my mother started cooking.” One of six children born to Jimmie and Baxter Leach, who moved from Schlater, Mississippi, to Memphis in the late 1950s, Aaron smiles wide as he calculates the fare for my plate of braised oxtails, brothy pinto beans, stumpy okra pods, and crunchy-rimmed cornbread muffins. The matter is settled, says that enveloping grin. 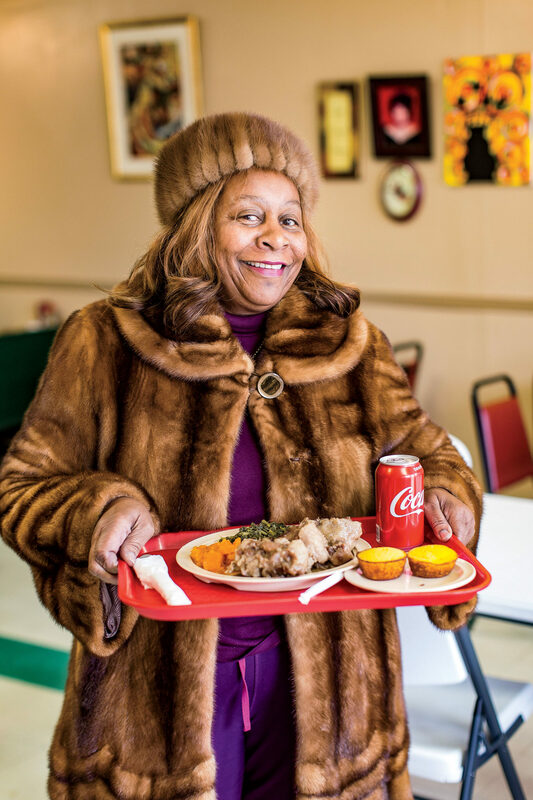 But the story of Ms. Girlee’s, a celadon-walled café with a mint-and-white checkerboard floor, set on a pilgrimage-worthy superblock of three soul food standouts and a hot-tamale truck, isn’t that simple. To understand how a storefront restaurant in a strip dominated by a barber college and two beauty salons became a Memphis institution requires fluency in labor history and knowledge of Martin Luther King, Jr.’s late-career push for economic justice.